This is 30 feet of conductive thread spun from stainless steel fiber and wound on a plastic bobbin. Use it to sew up all of your e-textile projects. This small bobbin is a great way to get into wearable electronics without the upfront cost of buying an entire spool of thread. 60 feet of thread is enough to get a simple design stitched onto your shirt, backpack or hat. 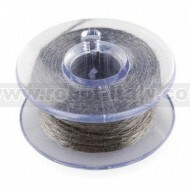 This is 30 feet of conductive thread spun from stainless steel fiber and wound on a plastic bobbin. Use it to sew up all of your e-textile projects. This small bobbin is a great way to get into wearable electronics without the upfront cost of buying an entire spool of thread. 30 feet of thread is enough to get a simple design stitched onto your shirt, backpack or hat.